With the North American launch of the Panamera just weeks away (slated for the Rolex Monterey Historics), Porsche took time in the month of July to introduce their dealer network to the new four-door flagship and they did so in style. 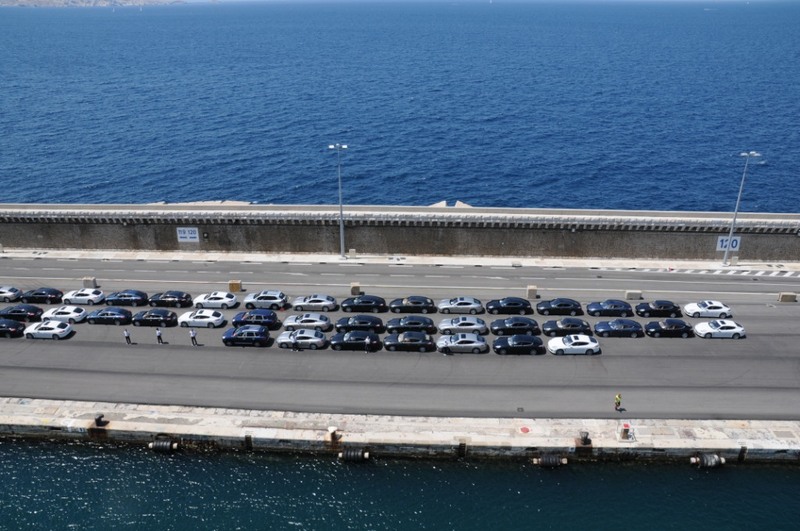 Dealer owners, and/or their representatives, were treated to a five day excursion to the Cote D' Azure (that's the French Riviera to you and me). Arriving by air to Barcelona, Spain dealers immediately embarked upon the cruise liner Crystal Serenity as it sailed through the night on its way to Marseille where a plethora of Panameras awaited their arrival and provided a strong statement about the event's focus. After an introduction to the car (and presumably a roadmap and directions) the dealers were off on a two day drive along the French coast passing through St. Tropez, Nice and Cannes, arriving at their final destination in Monaco. At all times, the cruise ship paced the group and awaited their arrival for what I can only assume would be a comfortable and luxurious way to spend the evening. Let's see, four days in the French Riviera on both land and sea. Cruising aboard a top luxury liner. Driving one of the most sought after and highly anticipated Grand Turismos through some of the most storied and scenic destination in the world. Sounds like a good way to build up excitement and anticipation among dealers as they await the first Panamera(s) to find its way to their lot. Based on the fact that Porsche has pre-orders for more than 3000 of them so far and the dealers understandable desire to sell them, don't be surprised if you might need to wait a bit before going for your first test drive. The pictures above and the information for the narrative come courtesy of our newest site sponsor, Porsche of Hilton Head. I was first introduced to this dealership through their general sales manager Wallace Higginbotham. Wally and I became friendly when he started publishing his own Porsche blog and we reached out to each other for introductions. Since then, Wally's site has grown to be the unofficial blog of Porsche of Hilton Head and provides everything from news, pictures and entertaining stories. What's great, is because of Wally's affiliation with Porsche and Porsche of Hilton Head, there are always a significant number of pictures and stories that the rest of us might not otherwise have access to. With regard to Porsche of Hilton Head, after spending some time discussing it with Wally we decided they would make a great addition to our growing list of sponsors. Why? Simple. While a lot of people like doing business with their local dealer (understandably) they might not always have access to the particular Porsche you want. Specifically, Porsche allocates certain cars (Turbos, GT3s, GT2s, etc.) based on the number of Carrera 911s sold. Porsche of Hilton Head is a well run shop and geographically placed in an affluent area. This results in a large number of 911 sales which provides them with a higher percentage of special Porsches than normal. Combine this unique access and other new car inventory with a large supply of in demand, pre-owned Porsches and you can see why it makes sense to reach out beyond your local area. Regardless if you're in the market for a new or used Porsche or not, definitely take a minute to check out Wally's Porsche blog (especially if you want to see more pictures about the Panamera dealer launch), welcome him here to FlatSixes.com and take a look through the Porsche of Hilton Head web-site. With Friends Like These, Who Needs Enemies?? How Did They Do That? Oh, Wait. They Didn’t!